Torri del Benaco is a pretty resort where life centres around the colourful harbour which is dominated by the 13th century Scaliger castle and its protective medieval walls. A great base to explore Lake Garda by bus or by ferry. The resort has charming churches and characteristic buildings that date from the days when Torri was the maritime capital of the lake. You can explore the lovely networks of lanes where you will find interesting craft shops and delicatessens as well as the odd gelateria. Around the harbour there is a large selection of cafés and restaurants where you can while away the day watching the world go by. The Internazionale is situated just across the road from the lake where there is a small pebble beach. The hotel’s décor is in a modern style and there is a pleasant sun terrace where you can sit and enjoy a drink and fabulous lake views. 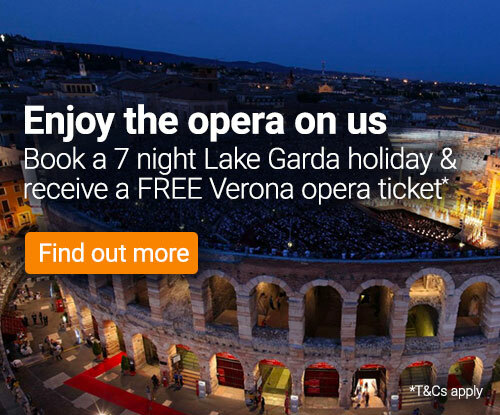 Two Centres | Combine your 7 night Torri del Benaco holiday with 3, 4 or 7 nights in Venice or Verona, or with a stay in Merano or Selva in the Dolomites.